Seldom appreciated is the vitality of a good radiator, as a Slingshot's engine only performs as well as its temperature will allow. As coolant flows through the engine it passes into the radiator under high pressure and dissipates its heat into the air before being recycled back into the rest of the coolant system to repeat the cycle. 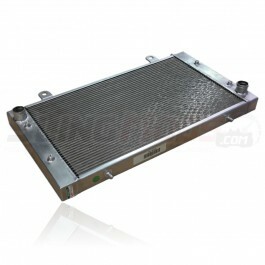 While in the radiator the coolant flows through flat tubes attached to the fins that make up the bulk face of the radiator. A well made radiator will help dissipate more heat faster, keeping a Slingshot at an optimal temperature for driving, whether that be a leisurely cruise or an adrenaline infused race.